"Just like yo' Irish mama used to make, and the brisket will melt in your mouth. Get a center cut of meat, not the 'point.' Super-tender and slices really nicely, just like butter. What little was leftover was made into a great hash the following morning." Spread baby carrots, potatoes, and onion into the bottom of a slow cooker crock. Pour water over the vegetables. Season the lean side of the corned beef brisket with onion powder and garlic powder. Set seasoned brisket onto the vegetables with the fatty side facing upwards. Pour beer over the brisket. Sprinkle contents of the spice packet over the brisket. Remove brisket to a cutting board. Stir cabbage into the liquid and vegetable mixture remaining in the slow cooker. Cook cabbage on High until tender, 30 to 45 minutes. 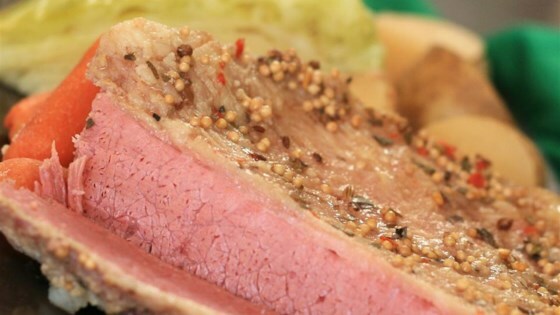 Slice corned beef and serve with cabbage mixture. Watch how to make perfect corned beef. I did not change anything, but should have....the amt of onion and garlic powders are way too much.